(NaturalNews) Averrhoa carambola, otherwise known as "starfruit," is believed to have originated from Indonesia and has grown to become a local favorite in Southeast Asia and parts of Australia. 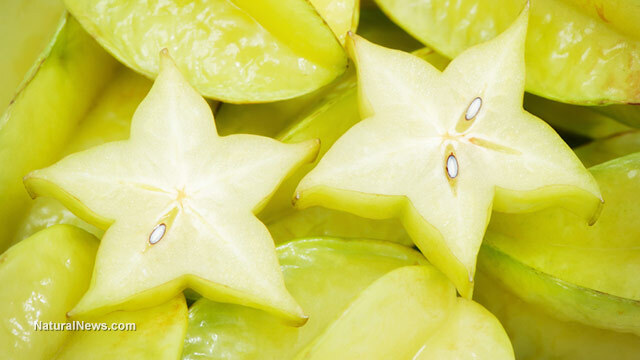 Starfruit, which has an oval shape and a sweet, tangy flavor, is generally 3 to 5 inches in length until it is cut crosswise into sections, which then resembles the shape of stars. Believe it or not, the entire fruit is edible, including its skin. It is generally a rule of thumb that, when selecting a starfruit, the yellower the fruit, the sweeter it tastes. It is important to chose a carambola that is shiny, firm and uniform in color. This tropical fruit is best to eat shortly after it ripens and does not need to be pitted or peeled. An indication of overripening would come in the form of brown spots or discoloration on the fruit's exterior. Simply rinse in cold water and cut the fruit crosswise into stars. The carambola is best when stored at room temperature and eaten within two to three days; if not, it may be refrigerated for up to a week or two. Starfruit may be eaten as a fruit, mixed with spices, pickled, dried or made into chutney or jam. In Southeast Asia, it is used for cooking purposes, along with sugar or agave to produce desired sweetness. In Australia, it is used to create jam or in soups and stews, more often used as a vegetable than a fruit. In Hawaii, starfruit can be made into sherbert. And in India, the juice is often bottled for drinking. Not only is starfruit versatile in its consumption, but it is both low in sugar and calories. Starfruit is high in antioxidants and is a source of potassium, vitamin C and B-complex vitamins. It is also antimicrobial, much like grapefruit, which helps protect the body against E. coli and other foodborne illnesses. Often overlooked at grocery and healthfood stores, starfruit may be consumed on its own, as part of a fruit salad or blended in a blender, along with other fruits, to create a fruit smoothie or tropical refreshment.